An affordable range of low maintenance high gloss white GRP garage doors ideal for price conscious trade, contract and DIY customers. Available in standard sizes and made to measure. The seamless door panel gives an attractive appearance compared to steel doors which have visible panel joints on the face of the door. 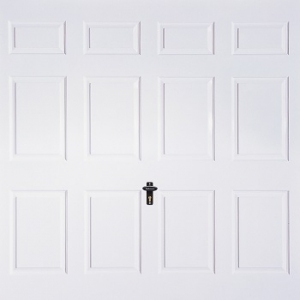 Ultra stable, resistant to low impact knocks and bangs, with a corrosion resistant door skin that is ideal for coastal properties. Offered with a choice of canopy or retractable CE marked counterbalance mechanism making the door light, smooth and safe in operation. The retractable mechanism is required when an automation kit is to be added now or in the future. 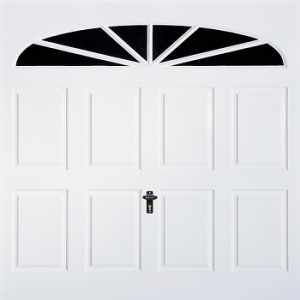 The door is constructed by means of a white powder coated lightweight steel chassis and clad with a white GRP skin. Just the occasional wash down will keep the door looking in pristine condition. The GRP door skin is manufactured at Wessex garage doors, Britain’s leading GRP garage door manufacturers who also manufacture the door skins for Hormann and Garador. Two-point cable operated locking included with four-point upgrade available at low cost. Doors to be made automatic and required without a handle/handle hole can be requested at time of order. The optional white steel goalpost fixing frames make on-site installation quick and easy. Alternatively the traditional method of installing the door to a timber goalpost frame can be enjoyed.